The previous version of Quicksort was easy to understand, but it was not optimal. It required copying the numbers into other arrays, which takes up more space and time. To make things faster, one can create an "in-place" version of Quicksort, where the numbers are all sorted within the array itself. Create an in-place version of Quicksort. This time, always select the last element in the 'sub-array' as a pivot. Partition the left side and then the right side of the array. 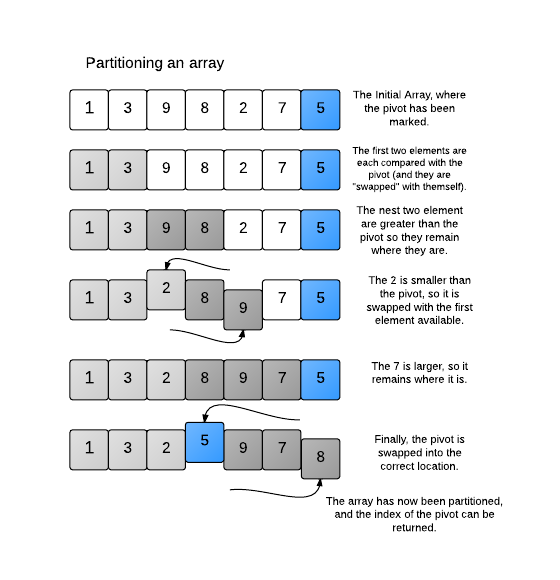 Print out the whole array at the end of every partitioning method. Instead of copying the array into multiple sub-arrays, use indices to keep track of the different sub-arrays. You can pass the indices to a modified partition method. The partition method should partition the sub-array and then return the index location where the pivot gets placed, so you can then call partition on each side of the pivot. Since you cannot just create new sub-arrays for the elements, Partition will need to use another trick to keep track of which elements are greater and which are smaller than the pivot. If an element is smaller than the Pivot, you should swap it with a (larger) element on the left-side of the sub-array. Large elements can just remain where they are, and the pivot can then be inserted in the middle at the end of the partition method. To ensure that you don't swap a small element with another small element, use an index to keep track of the "small" elements. Explanation of Sample I/O The 5 is initally selected as the pivot, and the array is partitioned as shown in the diagram. The left side is partitioned next, with the 2 as the pivot. Finally the right side is partitioned, with the 8 as the pivot. The entire array is now sorted. Shouldn't the correct output on the first line be 1 3 2 5 9 8 7? The 8 comes before the 7 in the input. @Kendall, in this version of Quicksort, you don't move numbers that are already in their correct half. Since 7 > 5 (the pivot value), it stays where it is. Got it. Is this method faster than using nested for loops and finding the smallest number in the inner loop and then switching it with the left most element (the outer loop moves where the left most element is)? Quicksort is among the fastest sorts in the average case. Technically, it runs in O(n log n) time (see the next Node for a brief look at it's running time). I'm not sure what you're describing, but it sounds like a Selection Sort which would have a O(n2) running time (like Insertion Sort). You have 1M numbers to sort. Quicksort takes ~ O(n log n) time which is 1M*log(1M) =~ 20M operations. Insertion or Selection Sort would take O(n2) time which is 1M2 or 1012 operations.